Inductor Machines: why is constant flux achieved before reaching nominal speed? 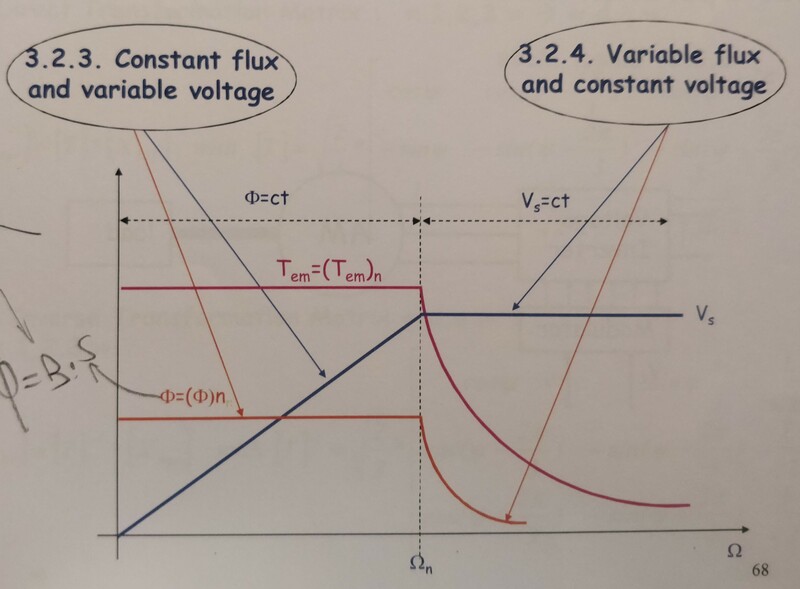 It is observed that an induction machine increases its voltage linearly before reaching its nominal speed. This is achieved due to the emf generated by the rotor movement. Could anyone shed some light in this matter? The curves presented in the question show the typical continuous torque capability, stator voltage and stator flux for an induction motor controlled by a variable frequency drive (VFD). The induction motor does not increase its voltage due to back emf. The VFD is designed to apply stator voltage in proportion to the applied frequency. That is what is required to maintain constant flux in an inductor as the frequency of the applied voltage increases. The flux is kept constant in order to keep the motor's torque capability constant. It is generally desirable for the motor to be capable of producing as much torque as it can from standstill up to the nominal design speed. The nominal design speed is usually the nominal speed for operation at mains frequency. The flux necessary to produce rated torque capability at rated slip is usually close to the maximum flux supported by the magnetic circuit. With most design configurations, the VFD can not produce the voltage required to keep the torque constant. Therefore torque capability decreases as speed increases. The decreasing torque is usually sufficient tor produce constant power up to about 150% of nominal speed. Not the answer you're looking for? Browse other questions tagged motor induction-motor vfd or ask your own question. In field controlled dc motor, why does the armature current remain unchanged even if it is affected by field flux? When/How does the rotor stop accelerating in a motor? DC motor speed and torque circuit equation, why is the current changed while voltage constant?